Are you struggling with Overcoming Shame of Infidelity? Read these 6 ways for a wayward spouse to finally get free. were suddenly out of my life or gone silent. Even my own father, who I love and have been close to my whole life, went silent during that season. For some people, the disappointment is just too much to deal with. I don’t fault them. But I’d also never felt so much shame or alone in my entire life. I witnessed the heartbreak of many lost friendships, gossip and judgment which only reconfirmed my shame and guilt. But I also experienced the amazing power of unconditional love and forgiveness from others. For those people I will be eternally grateful. Many of us who have been the wayward spouse, have felt (or will feel) the sting of shame over what we have done. We may have tried to shut the door to our guilt, or compartmentalize the affair while we were in it. But at some point, if you have any kind of conscious, values or compassion; shame and guilt will catch up to you. 2. verb (of a person, action, or situation) make (someone) feel ashamed. 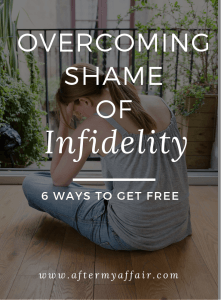 So, how do you overcome shame of infidelity? I want to share the ways I have worked at overcoming shame and guilt in my life from my own infidelity. Plus offer you some ideas I discovered from others. 1. Recognize that not all shame is bad. We are conditioned to think it is always a bad thing, and oftentimes it is. But it can also be our souls way of creating an alert, or warning, for you to pay attention to that something is wrong. (soul= mind, will and emotions). We each have an internal moral compass of values that we may have taken a lifetime to accept and believe. when we have not been true to our core standards of what we believe to be right or wrong. That breaking of our own standards creates the conflict within us, and where shame often derives from. will be very important for your betrayed spouse to see, if there will be any chance of marital recovery. Maybe a better word for that would be regret and empathy for the pain our infidelity has caused them. But beyond that, if you’re in the pit of shame and guilt and it’s swallowing you up like quick sand, that’s not going to help anyone. That is the type of shame I’m talking about now. Not the ‘conviction of your conscious, stop what you’re doing’, good type of shame. And I have been there my friend. It can certainly take over your life if you’re not careful. Honestly, it’s often one of my biggest struggles still, 12 years after my affair. 2. Humbly confess what you have done: to God and to your spouse. Acknowledge the pain you’ve caused to your spouse. This means sincerely apologizing for your wrongdoing, to your spouse, to God and whomever else you feel you need to (kids if they’re old enough to know). But it’s humbly seeing the harm and hurt your actions caused the one who loves and trusts you the most, your spouse. Also, remember that being sorry, or repentant , means not blaming your spouse for YOUR behavior. I hear of so many wayward spouses who are still blaming their spouse for causing them to have an affair. If you’re still pointing the finger at your spouse and all they did to cause YOUR affair, then I’m sorry but you’re not there yet with humility and repentance. When we’re in the middle of the affair, we often close our hearts off to what we’re doing, as I mentioned earlier. and humbly confess what we have done, we must take ownership for our own choices. Their bad behavior never excuses your own bad choices. I have personally found that until I confess my sins to God and ask for His mercy and strength to turn from those sins, I will not feel free. Shame and guilt will continue to follow me around. So that’s really important. (I don’t know if you are coming from a faith in God like me, I’m just sharing what has worked for me). not based on your past failures. Although this one is similar to #2 it’s different because this is reminding yourself how God sees you now that you’re forgiven. If you’re a person of faith, then you know there is an enemy of your soul that would love nothing more than to use your past failures against you. He would love to see you waste your life, over this mistake and failure, by living in constant shame. To overcome this, we often need to remind ourselves, everyday sometimes, that we are a forgiven daughter of the King. When God looks at us, He doesn’t see our sin but only love. When we’ve truly confessed our failures to Him, He doesn’t want us to stay in that place of shame anymore, but of peace and gratitude for his love and forgiveness. It may be a temptation to go back to self-condemnation. we insult him when we go back to the shame again and again. It’s like we don’t really believe that he’s forgiven us. let’s say you’ve repeatedly told your child not to play ball in the house. But they continued to do it. and breaks a beloved family heirloom – a treasured vase. This vase was handed down from your grandparents and irreplaceable. Your child feels awful, cries, and is so sorry. After you feel upset, you hold them, and tell them you forgive them. But what if the next day, your child comes to you in shame and says over and over again how sorry they are? What if they told you they were sorry everyday? Wouldn’t you be sad if they didn’t believe that you’d forgiven them already? It would feel like they didn’t trust your forgiveness. Well, if we could feel that way as human parents, how much more does God love and forgive us when we’ve really messed up? I used to think my sin was worse because I went into it knowingly and it wasn’t like this was done to me. Plus there’s an extra element of shame as a christian woman who commited adultery. “I tell you, her sins–and they are many–have been forgiven, so she has shown me much love. You and I know what it means to be forgiven for much, right? 4. Grieve the loss of the old vision you had for your life. You might have had an image of yourself, who you really were and what you were capable of doing and not doing, before your affair. You also probably had a vision of what your marriage story would be for your future together. I would guess that infidelity was not part of that vision. And when we are the ones that negatively altered our story of how it would be, it can bring on a lot of shame and guilt. But the obvious truth is, we can’t change our past. We can’t erase this part of our story, no matter how much we want to. There’s definitely a grieving process once you’ve come to this place in your affair recovery. It’s a loss of what you thought life would be, and maybe even the image you had of being the perfect couple. But moving through the grief of that loss is very important for you and your spouse to do. Just as in any other grieving process. I’ve found I had a lot of expectations on myself, and our marriage, to be this ‘perfect couple’. And for many years, we had a great story. I wouldn’t have imagined unfaithfulness ever being part of that ‘perfect story’. So, that sent me spiraling in shame for a long time. We must grieve the loss of our old image and embrace the new story we have now. It’s probably not the story you wanted; me either. that develop the closest bond in marriage. So, yes, grieve for the old image and vision you had for yourself and your marriage. But then, believe that this next half can be better than before, and create a new image and story for yourself and your marriage. Which leads me to this next one. 5. You have a choice now to be the hero in your own life. When everything else is stripped away, and your reputation and image are shot, who do you want to be? What do you want your life to look like from here on? Even if your marriage doesn’t make it through this, and you end up divorced, what kind of Woman, Mother, Daughter, Friend, do you want to be? Because it all comes down to that my friend. When it’s all stripped away and the ugly truth of what we’ve done is laid bare for all to see, our natural inclination is to want to hide in shame. we can begin to believe we really are an awful person. You may have done this ‘bad thing’, but that does not make you a ‘bad person’. You are not what others say about you. And you’re not what your past ‘acting out’ even says about you. So instead of sitting in that mud of self-pity and condemnation, chose today who you will be. You might think I’m making this simplistic. Well it is to some extent. Nobody is in more control of your own actions and life than you are. You have a new start here. Let this be the catalyst to your new story. Prove the haters wrong. There’s nothing better than a changed life. I’m a sucker for movies that show the main character being really awful, or having it hard in the beginning, and showing a changed life at the end. Like ‘The blind side, The Help, Christmas Carol (has to be the one with George C. Scott),’ and so many others…. God’s in the redemption business, and He loves taking humble and broken people and redeeming them into humble, open people who depend on Him daily. There’s a You Tube video you may have seen, I’ll give the link below called “Be the hero of your own story.” By, Joe Rogan. He’s a rough around the edges, tell it like it is, guy. But this message is awesome and so true. Be THAT hero in your life. Let this be a tool of self-examination and reassessing your life. Or, wow, look at their marriage now and how they’ve turned it around? Be the hero in your life that YOU can be proud of. What does that look like? Get that new image and mindset of yourself and your life now. 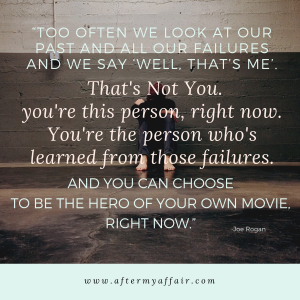 “too often we look at our past and all our failures and we say ‘well, that’s me’. That’s not you. You are this person, right now. You’re the person who’s learned from those failures. Don’t let shame keep you stuck and from having a life of purpose God created you to have. But how do you get to become that hero in your own life story if you’re feeling so much shame all the time? 6. Create a new mindset where the hero of your story will survive. Have you ever watched a movie where the hero dies? I kinda hate those movies. Of course another hero usually ends up emerging later. But, (continuing the theme of changing to become the hero in your own life), what happens to the hero (you) in your life? How do you keep from killing off the hero in your own movie (your life) and keep from sinking back into the shame of your affair? When you walk around every day in guilt and shame, it keeps you from the potential you have to use it for good. So our mindset shifts when we take another angle to see ourselves, and our story. we’ll start to see our shame melt away. How do you create this new mindset? Are you speaking badly about yourself, just like others may have spoken badly about you when you were unfaithful? Practically speaking, you might have to have 3×5 cards in front of you speaking affirmations, or scriptures, over yourself. be really be mindful of what you’re telling yourself about your story. Do the next right thing, every day, until you turn that hero you want to be, in your reality. You see, your story and mine, is always evolving. From our failures, can come redemption, and new beginnings, that help other people through their pain. 1. Overcoming the shame of infidelity starts by recognizing that shame is can be a warning signal to us that we’re going against our core values. 3. but then we must constantly remind ourselves of how God sees us, not just how we feel. 4. Let yourself grieve the loss of the image you had in your mind of how you thought you, and your marriage, would be. 5. Use this time in your life as a turning point to be the person you want to be, to be the hero of your own life. Don’t let your past failure dictate your future. You are NOT the mistakes you’ve made from your past. 6. Finally, to continue in that path, renew your mind and mindset of how you see yourself and use your past failures to help others. Your past does not define who you really are today. We can’t change the past but we can shape our future, and hold a hand out for others who are where we were. What is the hardest part for you right now, in overcoming shame of infidelity?